SOUTHWEST ASIA (Aug. 06, 2004) -- Thousands of concrete barriers dot the landscape at one forward deployed location. While some bear graffiti, a few are graced with art intended to last as long as Coalition forces work at the installation. 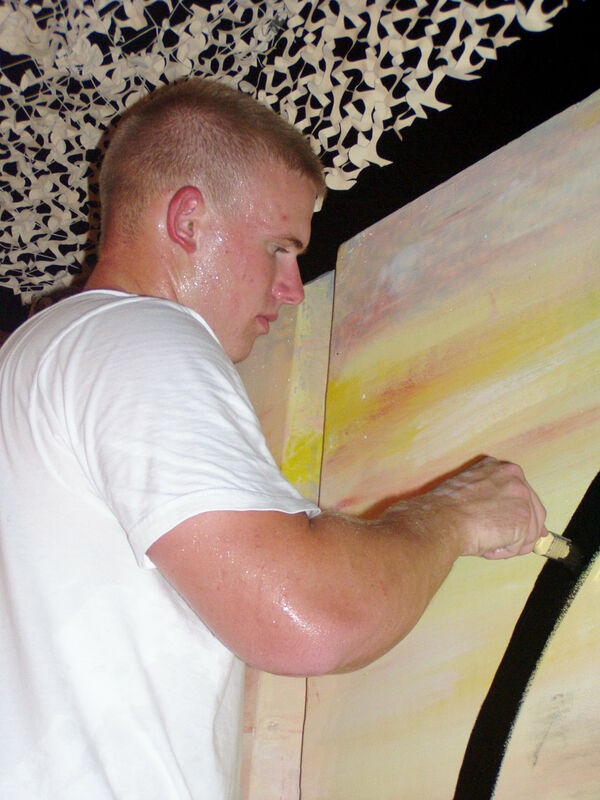 Airman 1st Class Shrett Lettinhand, 379th Expeditionary Security Forces Squadron, is one of the artists whose barrier paintings are intended to last. She is a security forces troop who hit her one year time-in-service mark about the same time she deployed to Southwest Asia. By the time she goes home, following a six-month tour in the region, she'll have spent a third of her career in DCUs and left a mark that Coalition partners and base visitors will be seeing for years to come. Airman 1st Class Shrett Lettinhand, 379th Expeditionary Security Forces Squadron, works nights during her deployment to paint "Jersey barriers" around the installation. Her largest project to date is a 21-barrier mural at the Point Heritage Club that features an "oasis" theme. When completed, the mural will feature palm trees, camels and 21 squadron logos. Airmen Lettinhand is deployed from Misawa Air Base, Japan. "Basically, I paint a lot of stuff for the cop squadron," Airmen Lettinhand said. "I did two murals at the main gate -- those were requested by the base commander. I also painted the security forces barrier." Her work at the entrance to the installation features a welcome message for visitors and a security forces logo. At the front of the security forces compound, she painted a welcome sign. Airmen Lettinhand paints on "Jersey barriers." The barriers are huge, upright concrete slabs used as a barricades and as dividers on roads. They take their name from where they were first used, the New Jersey Turnpike. Locally, the barriers are seen around parking lots, entry control points, on the flight line and around high-security facilities. The barriers are usually gray or white. Right now, Airmen Lettinhand is working on an additional piece for her squadron. It will feature four original designs of hers. Each one, a comic book-style figure, represents a different flight within the 379th ESFS. She said she is influenced by comic books. "I'm into traditional type comics like Spawn, Spiderman, Punisher and stuff like that," Airman Lettinhand said. "That's where I get my regular drawing style, from comics." 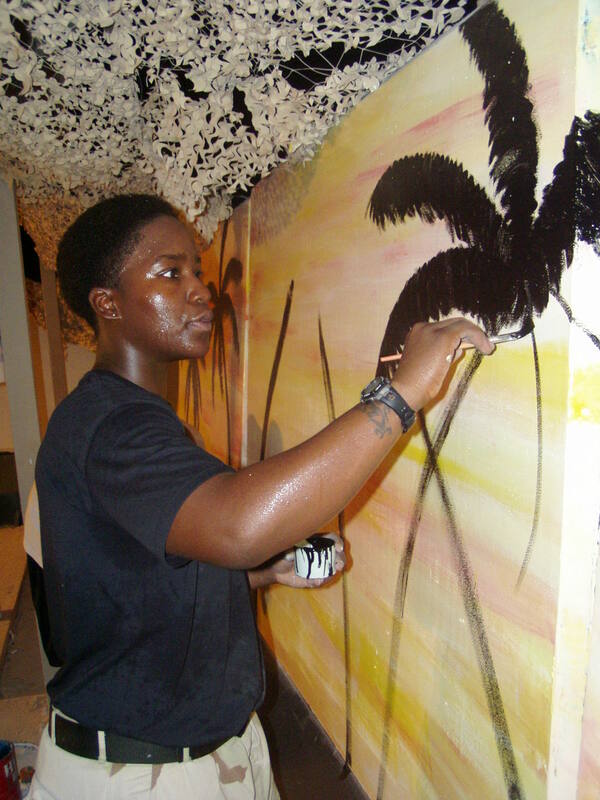 Airman Lettinhand said she is also influenced by more traditional painters like Edouard Manet and Leonardo DaVinci. Airman 1st Class Jason Smith, 379th Expeditionary Security Forces Squadron, paints a palm tree on a "Jersey barrier" at the Point Heritage Club. The barrier is just one part of a 21-barrier mural that will feature palm trees, camels and squadron logos. He is deployed from Misawa Air Base, Japan. Before she heads back to her home station, she hopes to finish her biggest project yet, a mural at one of the clubs at the installation. "At the Heritage Club I am doing 21 barriers with one theme… a tropical theme," she said. "In the center of (each barrier) is every squadron symbol." 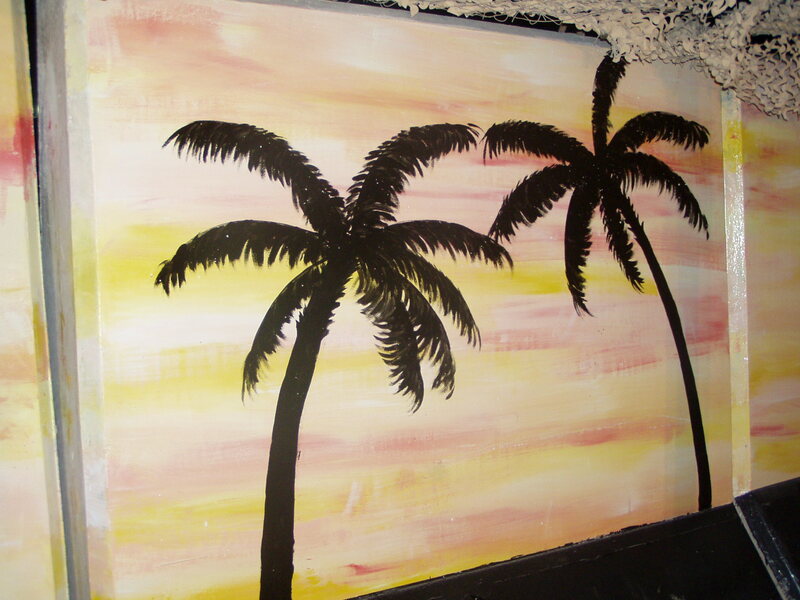 The mural will feature palm trees and camels over a colorful purple and orange dusk sky. At the center of each barrier will be a squadron logo. To finish the mural, and to do all of her work, Airmen Lettinhand works at night. She says the extreme temperatures force her to work after hours. "It's too hot in the day," she said. Temperatures can reach as high as 120 degrees in the region. "The paint would dry up in the can, so I can only work at night." Besides painting public art on barriers, Airmen Lettinhand works in oils, pencil, computer graphics and sculpture. While on deployment to Southwest Asia, she has even dabbled in body art. She's designed a lot of tattoos for her fellow deployed Airmen. Airman 1st Class Shrett Lettinhand, 379th Expeditionary Security Forces Squadron, works nights during her deployment to paint "Jersey barriers" around the installation. "Everyone asks me about tattoos," she said. "I draw a lot of tattoos. The weirdest one was a punk rocker. But that's the thing, custom tattoos. Nobody wants to pick a tattoo off a wall when another guy has the same thing." Airman Lettinhand said she advises her patrons to wait until they get home to get the tattoos she drew put on to their bodies. "I tell them the sun here isn't good for tattoos," she said. While Airman Lettinhand has no official training in art, she did take art classes throughout high school and then took a nine month course in computer graphics after graduation. She said that after her Air Force enlistment, she plans to get a master's degree in art, and become an instructor at the university level. She says she'll start working on her college education when she redeploys and scoffs at the notion it may be too difficult for her to take classes while being a cop. "If you want it -- cop or not -- you have twelve hours a day to yourself," she said. "Nobody says you can't bring the books out there. People use that excuse, but you can do it."